as an auction with a starting bid of $12,000 - a 45% price reduction from the originally posted asking price of $22,000.
. As of this writing, bidding had already surpassed $4,000 with over 3 days left to go in the auction. with a Buy It Now price of $22,000. The seller, who is based out of Arizona, is also accepting offers. 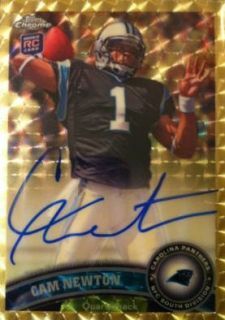 It's one of the most valuable (if not the most valuable) Cam Newton rookie cards in existence. It's in an extremely hot and popular set. The Superfractor name carries a lot of pedigree in the hobby as being the most desired one-of-one for a rookie. Package all that together and the you've got an iconic card that is bound to set the bar for football cards this year. It should also have a lasting impact in the hobby much like the 2010 Bowman Baseball Stephen Strasburg Superfractor had. The Newton Superfractor has gained lots of attention in the few hours since it was listed. Eleven offers were quickly made and promptly rejected. One would have to assume that the seller is holding out for a big price. Being that it's a one-of-one, it might be in his best interest as well. This is an instance where he's got something everyone else wants. He's going to come out ahead no matter what so he can test the market rather than opting to move it quickly. The auction is scheduled to close on Friday, November 11 at about 9:30 PM EST. If the Newton Superfractor is out of your price range, 2011 Topps Chrome Football has more than 40 other cards of the superstar rookie, including more than a dozen autographs. You can see samples of them in our 2011 Topps Chrome Football Visual Guide.